At the end of January 2016 TLT-Turbo GmbH acquired the majority shareholding previously held by the Industrial Development Corporation of South Africa Limited (IDC) and private investors. MechCaL’s management team remain as minority shareholders with key staff affirming their ongoing commitment to the company. TLT-Turbo is one of the world’s leading manufacturers of technology-driven industrial fans and ventilation systems. With a history of more than 140 years the TLT-Turbo GmbH develops and builds radial and axial flow fans and ventilation systems for thermal power plants, mine ventilation, wind tunnels and industrial applications like steel, petrochemical and cement. The products of TLT-Turbo GmbH must guarantee reliable and trouble-free operation for decades even under extreme conditions. The increasing complex market demands on systems and products require customized solutions. These solutions must reflect the best aerodynamics, engineering quality and low life-cycle costs. With a “passion for solutions” the employees of TLT-Turbo GmbH, its subsidiaries, branches and sales offices meet these global challenges. 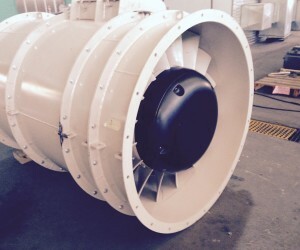 MechCaL was established in 2005 to design, develop and manufacture both axial and radial flow fans, making use of composite materials to improve efficiency and to create a range of products for various industries. MechCaL is at the forefront of innovation in the design and manufacture of industrial fans mainly for a variety of mining applications. MechCaL developed proprietary software that allowed them to create the initial award winning concepts for energy saving projects and have since combined this with established commercial codes to develop further technologically advanced fans. Their high efficiency robust products are able to outperform and outlast other products on the market while reducing CO2 emissions and achieving sustained power savings. MechCaL’s main focus in the development of fans is the use of advanced materials and customised solutions. Neff added that the new shareholder input would also allow MechCaL to further their investment into new products saying that it would bring renewed focus on the research and development of new products as well as further investment into different market sectors.